Aliaxis has a large site in the south east of England extruding and forming a wide range of Plastic pipes. The site has quite a mix of buildings: large production halls to 9 m high with a lot of daylight saving opportunity; open and narrow aisled storage to 6 and 8m high, associated production offices; canteen and washroom facilities and large areas of external storage yards. Vita Energia Solutions upgraded and re-lit a separate company on this site in 2010 and 2012 in two phases with fluorescent T5 products, and we continue to support that part of the site. The site was first developed in the 1950’s. As with many industrial sites it has been upgraded and re-built in parts over the years. However, some of the lighting was still very old. The site has been engaged in an aggressive programme of improving efficiency in all aspects of its business and part of that has been a project for a step reduction in energy consumption. The site has sought proposals from many companies over a numbers of years including some major international corporates and full broad spectrum process equipment, control system, and lighting energy reduction companies. Against tough competition and a competitive bidding process the Company carved out lighting upgrade specifically for VESL to design, supply, and execute. We were chosen for our experience and expertise, and specifically our ability to get the highest energy savings, using latest and most efficient LED components from, almost completely at this site Philips lighting, and at a highly competitive price and long term guarantee. 1400 lights were upgraded across the whole range of buildings and externally with a variety of our new fittings and our retrofit products. These include around 100 Quad 454 T5 fittings that were retrofitted to our LED 82200 upgrade providing a 58% saving and around 50 of 400W Low-Bay fittings with our new HiP LED 82200 unit for a 75% saving in main production units. These production halls have good roof light lanterns and panels. Part of the upgrade included circuit daylight sensor controls. The upgrade was done with minimum of disruption to ongoing 24/5 production operations. Aisle storage warehouses were upgraded from 4*55W PLL fittings to our extraordinarily efficient narrow aisle LED batten fitting with superior PIR’s included. We are achieving a 90% saving in these warehouses. 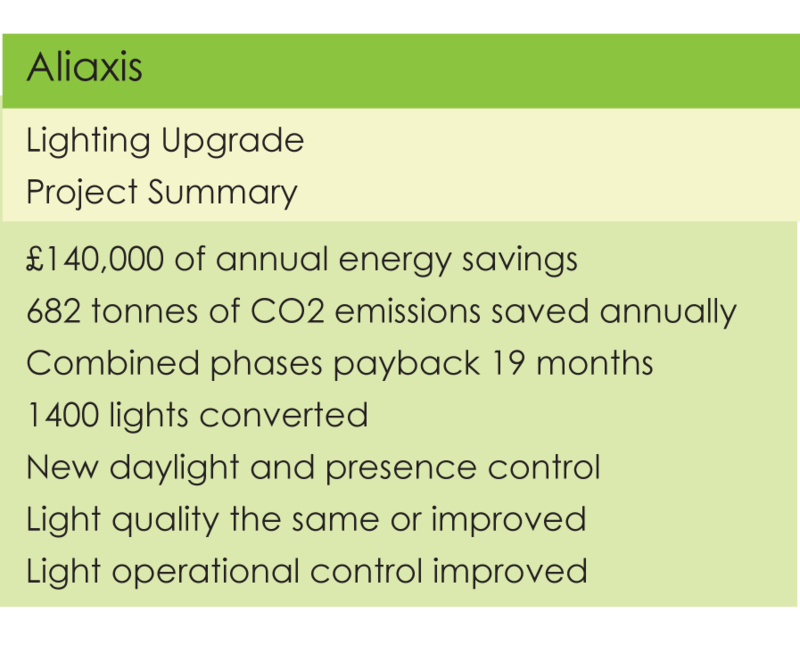 In one storage area we increased light levels from around 80 to 200 lux as well as achieving over 70% energy saving with our IP5 LED fittings. Externally the site has a large acreage of laydown storage. All external floodlights were replaced with our 81100 and 61100 LED flood lights. A set of old streetlights was upgraded with a bespoke design, using standard LED components again with high energy savings, but at a fraction of the cost of new street light heads.